Yozo Hamaguchi is a mezzotint artist. It was my first exposure to this art form and from what I gathered, it’s a metal printing method that fades colors. The pieces are still lifes, ethereal, simple, minimalistic. 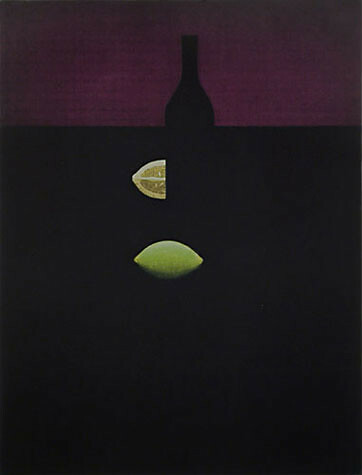 Subjects include lemon halves lit up next to a darkened wine bottle silhouette. Or a glowing darning needle plunged into a subdued multicolored ball of yarn. The colors fade in and out, transitioning from dark to slivers of light. The pieces are small, so they need a patient eye, willing to pick up subtleties. Downstairs there were some other print artists. I wasn’t terribly impressed with most of them, but I was struck by the lithographs of Hisaharu Motoda. 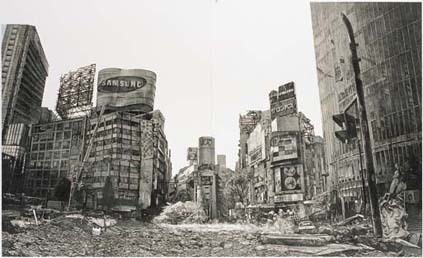 His compositions were of famous Tokyo landmarks in a post-human decay. Busy Shibuya Station’s Hachiko crossing was deserted and over-run with weeds, trees and leaf litter. Vines grew up Tokyo Tower. Glamorous Ginza was reduced to rubble. The line details and the subject matter could have been disturbing, but viewing nature retake human edifice was therapeutic. The Musee Hamaguchi Yozo is hard to find and out of the way, for me anyway. And the space is quite small, more the size of a private gallery. There are no other interesting landmarks to visit in the neighborhood. So I don’t know if it was worth it to trek out to this obscure central Tokyo museum. But the cute receptionist gave me a 200 yen discount for the cafe, and it was a proper cafe experience, with well-crafted joe, and what looked like amazing desserts, which I didn’t try, much to my regret. I went there because it was one of the museums that I could enter free with my Grutt Pass (a must for any Tokyo museum-goer). But for a print enthusiast, or if you’re in the neighborhood, it’s worth a stop.